We had only been moved in a short while. My new food processor was sitting there, begging me to use it. I had a half used package of Oreos, that had pretty much gone stale. I was having a chocolate craving (which happens at about 4:00 PM every day). I thought to myself, "Hey! I have that Oreo Balls recipe on my computer from How Sweet, I should make that!" Once I consulted the recipe, I realized....I didn't have cream cheese. Nor do I particularly enjoy it in my desserts. I searched the internet for substitutions but found nothing. But I figured...how hard could it be to just mimic the texture? So, I broke apart the Oreos I had left and put them in the food processor. Then I decided peanut butter might be a good substitute for the cream cheese, so I put some of that in there to. I processed for a while but...it was too thick. I added some more peanut butter. I added a little milk. Then I melted some chocolate and poured that in there too. That did the trick! 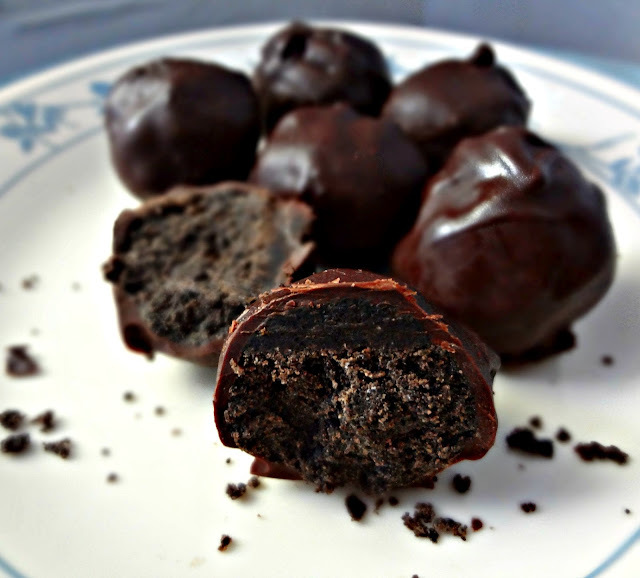 They seemed to be the exact same consistency as the actual "Oreo Balls"!. Then I did as my original recipe instructed, I rolled the mixture into many little balls, and put them on a tray and set them in the freezer for an hour or so. After they'd frozen and firmed up, I melted some chocolate and dipped them in and coated them (some got covered in milk chocolate, others in dark-I definitely think I preferred the dark chocolate). Then back to the freezer (where they remained)! They. Were. Per-fect! PERFECT! I loooved them, Michael loved them! It was a miracle! 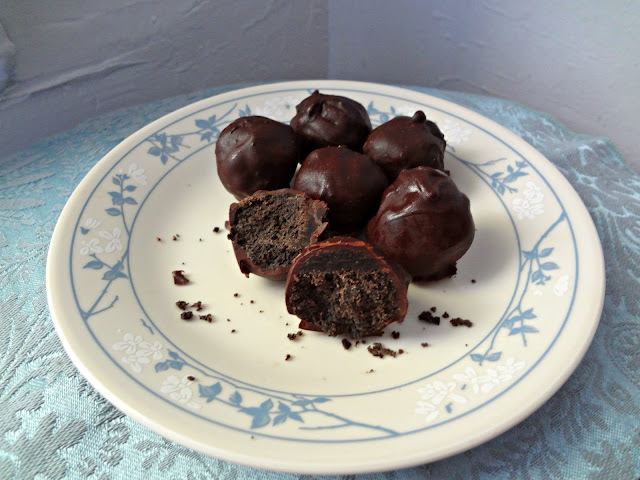 They were like yummy little peanut butter Oreo truffles and they were awesome-I hope you try them and love them as much as we did (and now I have something to do with leftover Oreos!) :). Break up Oreo's and place in a food processor. Add peanut butter and melted chocolate. Proccess until it reaches a consistency that will allow you to roll them into small balls. If too thick, add a bit of milk and/or extra melted chocolate. Rolls the mixture into small balls (about the size of a gumball). Place on a tray that is lined with wax paper or parchment paper and freeze for about 1 hour, until firm. 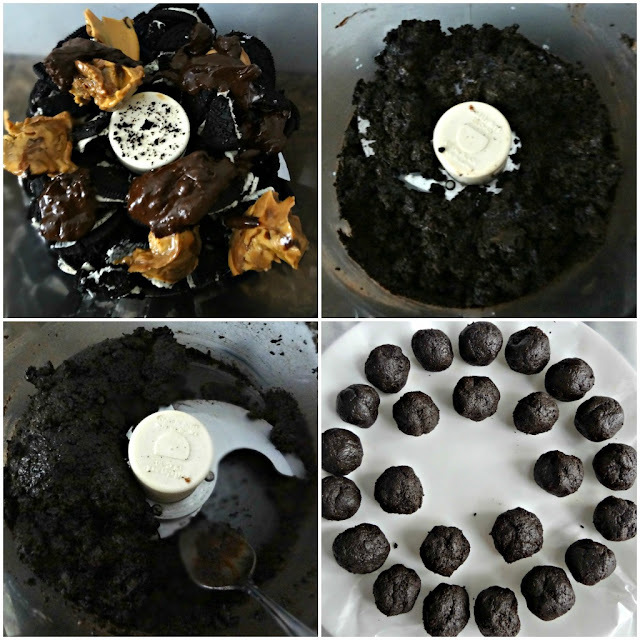 Melt some chocolate and dip the frozen Oreo balls in until coated. 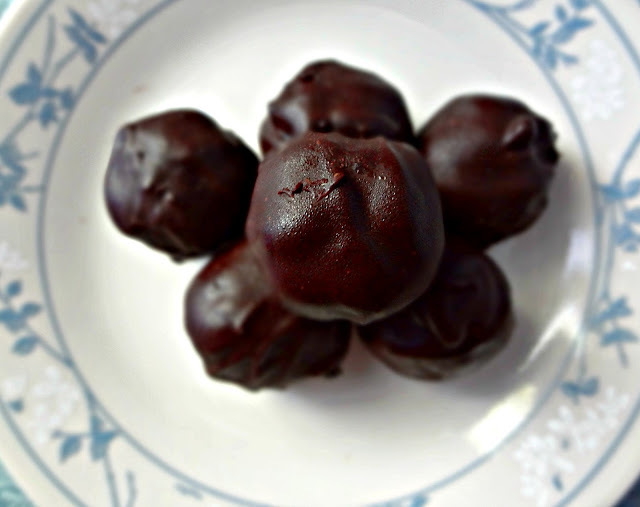 Place back on the wax or parchment paper and return to the freezer until the chocolate has hardened. Store leftovers in the freezer or refrigerator.